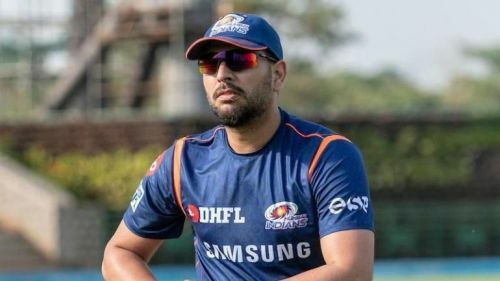 Mumbai Indians skipper Rohit Sharma and mentor Zaheer Khan have opened up on the under-fire Yuvraj Singh's role in the team, adding that they dished out the money for the stylish left-hander for his match-winning abilities. In the pre-season press conference, the duo also lifted the lid on other plans, such as Rohit Sharma's batting position and the youngsters to look out for. The three-time IPL champions retained as many as 17 players in their squad ahead of the auction, thereby keeping faith in the nucleus of the side. They snapped up just six players in the auction, the headline purchase being that of Yuvraj Singh, who has been rather dismal in the last couple of years across domestic cricket and the IPL. However, with the southpaw being one of India's best all-rounders across formats, there was a huge level of excitement among fans, as he is still regarded as someone who can turn the fate of a cricket match within a blink of an eye. Yuvraj went unsold in the first round of the action, creating a shockwave around the country. But in the second round, the Mumbai-based franchise bought him. Zaheer Khan in the press conference mentioned that players go unsold in the first round of auction owing to its 'dynamics'. “Many players go unsold. I’ve been unsold myself in the first round. Auction dynamics make you do that. Yuvraj Singh has been a boost to the side. We needed an experienced batsman who controls the game in the middle. Who is better than Yuvraj Singh to do this?" “Yuvraj, as we all know brings a lot of experience to the table. He is a match-winner." It will be interesting to see where Yuvraj slots in a stunning batting line-up such as Mumbai's, but his role has been now unearthed. Mumbai Indians kick-start their season at home to the Delhi Capitals on 24 March.